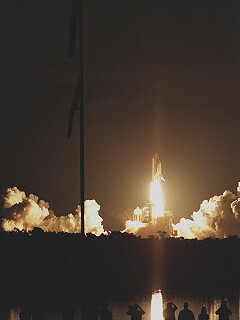 Launch from Cape Canaveral (KSC); night landing on Cape Canaveral (KSC), Runway 15. 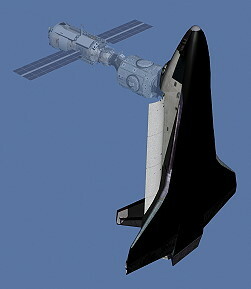 The STS-101 mission originally was designed to follow the launch of the Zvezda Service Module as the flight to outfit the Russian component as the early living quarters for crews aboard the ISS. When Zvezda's launch was delayed, Shuttle and Station managers agreed to fly Atlantis on two separate flights to the station this year, STS-101 to conduct maintenance and logistics work aboard the ISS in advance of Zvezda's arrival, and STS-106, to unload supplies onto Zvezda from both the Shuttle and a Russian Progress resupply vehicle. 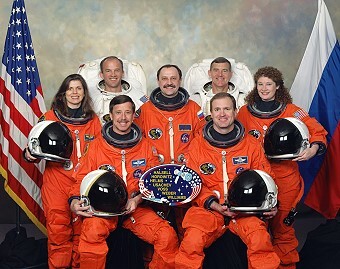 STS-106 was launched in September 2000, about five weeks after Zvezda's July 2000 launch on a Proton rocket from Baikonur. 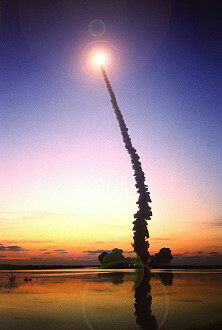 The launch was delayed three times due to high winds. 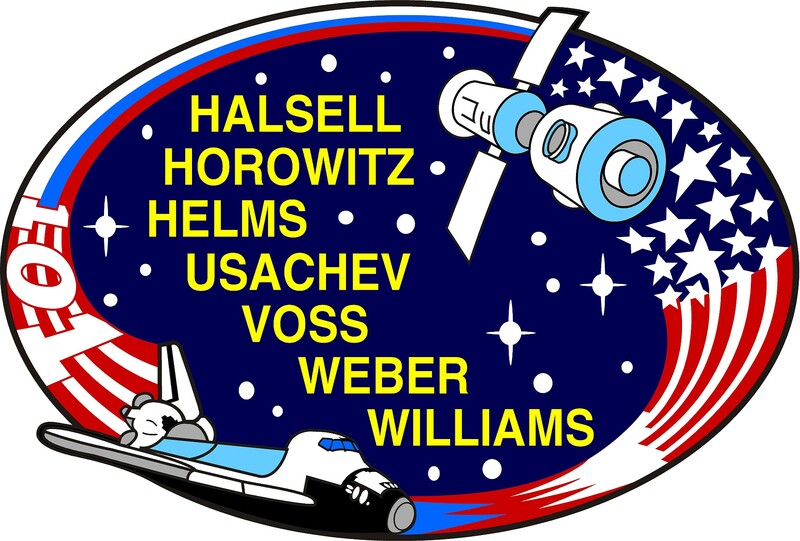 Objective of mission STS-101 (third Space Station assembly mission - ISS-03-2A.2A) was repair, resupply and construction tasks aboard the International Space Station. This was the first launch with new electronic cockpit displays and other upgrades. The top priority of the docked phase of the mission was to replace four of six 800-ampere power-producing batteries in Zarya which were no longer operable, and its associated electronics for proper current regulation. Zarya received additional new equipment including four cooling fans, three fire extinguishers, 10 smoke detectors and an on-board computer. A suspect radio frequency power distribution box (RFPDB) in Unity used as part of the early S-band communications system was replaced during the time Atlantis was linked to the new international facility. The crew transferred almost one ton of equipment from a double Spacehab module housed at the rear of Atlantis' cargo bay into Zarya and Unity for use by the Expedition One crew later in 2000. 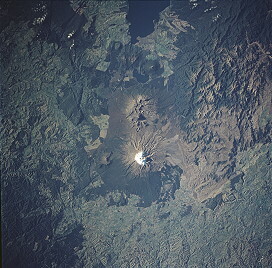 Those logistical items included personal clothing and hygiene gear, medical and exercise equipment, computer equipment and printers, hardware for the eventual setup and activation of the station's Ku-band communications system and a centerline camera for Unity's common berthing mechanisms to which other ISS components were mated. Four large bags of water also were brought from Atlantis into the ISS for later use. For the first time, on mission STS-101, 11 new full-color, flat-panel display screens in Atlantis's cockpit replaced 32 gauges and electromechanical displays and four cathode-ray tube displays. This new "glass cockpit", technically labeled the Multifunction Electronic Display Subsystem (MEDS), was 75 pounds (34 kg) lighter and used less power than before; and its color displays facilitated pilot recognition of key functions. The new cockpit was installed in all shuttles by 2002, setting the stage for the next cockpit improvement planned for 2005: a "smart cockpit" that reduces pilot workload during critical periods. 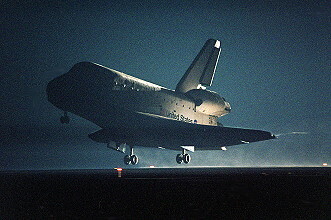 On STS-101, Atlantis flew with more than 100 new modifications incorporated during a 10-month period at Boeing's Palmdale, Calif., facility in 1998. The airlock was relocated to the payload bay to prepare for International Space Station assembly flights; the communications system was updated; several weight reduction measures were installed; enhancements were made to add protection to the cooling system; and the crew cabin floor was strengthened. 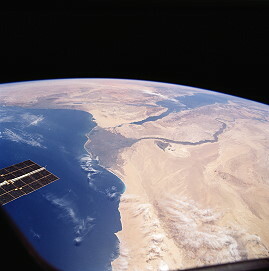 Following a two day solo flight the Atlantis docked with the ISS on May 20, 2000. 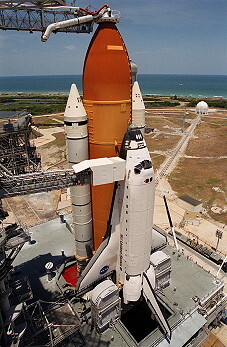 The primary mission objectives for STS-101 was to deliver supplies to the International Space Station, with the supplies hauled up using a Spacehab double module and Spacehab Integrated Cargo Carrier pallet, perform a spacewalk and then reboost the station from 230 to 250 statute miles (370 to 402 km). Detailed objectives included ISS ingress/safety to take air samples, monitor carbon dioxide, deploy portable, personal fans, measure air flow, rework/modify ISS ducting, replace air filters, and replace Zarya fire extinguishers and smoke detectors. Critical replacements, repairs and spares were also done to replace four suspect batteries on Zarya, replace failed or suspect electronics for Zarya's batteries, replace Radio Telemetry System memory unit, replace port early communications antenna, replace Radio Frequency Power Distribution Box and clear Space Vision System target. Astronauts used the SPACEHAB Integrated Cargo Carrier to accommodate and support the transfer of exterior cargo from the shuttle orbiter to the International Space Station and from the station to work sites on the truss assemblies. The ICC provided sufficient surface area in the orbiter cargo bay to carry approximately 8,000 pounds (3,629 kg) of cargo, which would otherwise have to be carried in the shuttle's cabin. The ICC was an unpressurized flatbed pallet and keel yoke assembly housed in the orbiter's payload bay. Constructed of aluminum, it was 8 feet (2.4 meters) long, 15 feet (4.6 meters) wide and 10 inches (25 centimeters) thick, and was capable of carrying cargo on both faces of the pallet, both on top and below. There were no active interfaces (thermal, electrical or data) to the shuttle. 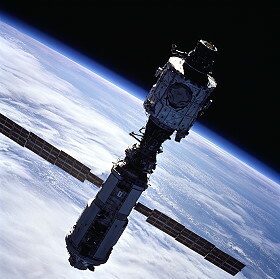 On Mission STS-101, the ICC carried three cargoes: parts of the Russian Strela crane, the Space Integrated Global Positioning System/Inertial Navigation System (SIGI) Orbital Attitude Readiness (SOAR) payload, and the SPACEHAB-Oceaneering Space System (SHOSS) box. 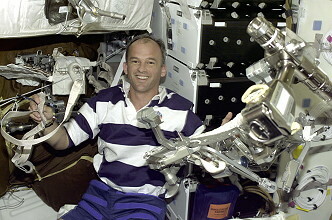 James Voss and Jeffrey Williams performed the only EVA on May 21, 2000 (6h 44m). They installed the final parts of the Russian built crane, replaced a faulty antenna and installed some handrails and a camera cable. When James Voss and Jeffrey Williams stepped from Atlantis' airlock, their first job was to set up the foot restraints, tethers and other gear essential for safely executing activities in space. Then they could go to work. First they headed to a workstation fixture on pressurized mating adapter (PMA)-1, the passageway connecting U.S. module Unity and Russian-built control module Zarya. The objects of their attention were the fixture itself and a small, 209-pound (95 kg) U.S. space-walker-operated crane. Mission Specialists Tamara Jernigan and Daniel Barry placed it there during the first logistics mission STS-96. The crane was not mounted to the fixture as tightly as expected. Although it posed no hazard to ISS components, James Voss and Jeffrey Williams inspected it and its fixture to ensure that neither is damaged or otherwise compromised. They attempted to secure the crane in its housing, or relocate it to another, identical housing elsewhere on Zarya. The two mission specialists returned to the airlock to get the spare Early Communications antenna and pick up a grapple fixture for the Russian crane Strela. 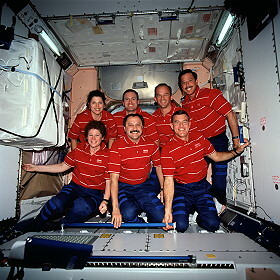 From there they went to the SPACEHAB Integrated Cargo Carrier (ICC) in the shuttle's cargo bay and obtained the rest of the components and tools required to complete assembly of Strela, begun by Tamara Jernigan and Daniel Barry on STS-96. Finishing the assembly job required about 100 different actions, steps and processes from the time James Voss and Jeffrey Williams arrive at the ICC to get the crane's 45-ft (13.7 meters) telescoping boom to the completion of its assembly at its workstation on PMA-2. 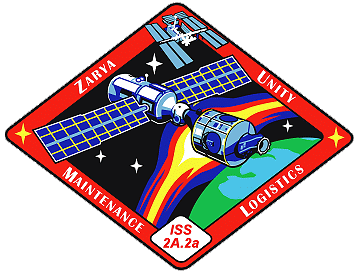 Strela, which is an updated version of the crane used on MIR, was moved to Zarya during the September 2000 logistics mission, STS-106. Next, James Voss and Jeffrey Williams replaced an Early Communications (ECOMM) System antenna mounted on the port side of the common berthing mechanism at Unity's forward end-cone. It is one of two used for crew videoconferences, command activities and telemetry backup. The job of swapping out the device was relatively straightforward. 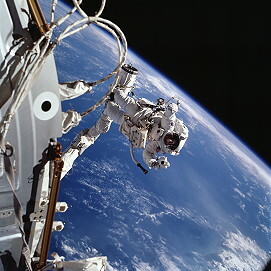 It essentially involved disconnecting four cable connectors, releasing the antenna from its mount, installing and reconnecting the new antenna, and checking its alignment. Only two more tasks remained to be completed: installation of the centerline camera cable and attachment of eight handrails on Unity. The equipment was in a bag Tamara Jernigan and Daniel Barry left behind for James Voss and Jeffrey Williams. 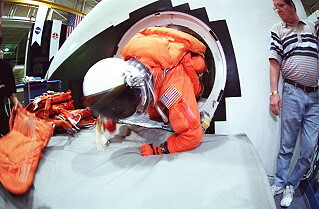 Jeffrey Williams retrieved the bag, then moved to the connecting module's starboard side to meet James Voss and gave him the cable. Installation of the cable simply required that James Voss secured it with wire ties to handrails already attached to Unity. Jeffrey Williams at the same time used a power tool to securely bolt the new handrails to the module's forward, mid and aft sections. The crew had to do several repairing work (replacement of batteries) in the ISS. The mission also included incremental assembly/upgrades such as assembly of Strela crane, installation of additional exterior handrails, set up of center-line camera cable, installation of "Komparus" cable inserts and reseating the U.S. crane. Assembly parts, tools and equipment were also transferred to the station and equipment stowed for future missions. The station was also resupplied with water, a docking mechanism accessory kit, film and video tape for documentation, office supplies and personal items. Crew health maintenance items were also transferred including exercise equipment, medical support supplies, formaldehyde monitor kit and a passive dosimetry system. The BioTube Precursor Experiment tested newly developed technologies involved in the BioTube Magnetic Field Apparatus, a device for growing seeds in microgravity that was flown on STS-107. This precursor experiment, which occupied half of a locker in the middeck of Atlantis, evaluated the MFA's water delivery system and seed germination substrates. This mission was almost similar to the Columbia disaster. A damaged tile seam caused a breach which allowed superheated gas to enter the left wing during reentry. The gas did not penetrate deeply and the damage was repaired before the next flight. If it had penetrated deeply the Shuttle could have been destroyed during reentry.